ARE YOU STRONG ENOUGH TO GO SUPERNOVA? You think you can handle the nuclear intensity of our new pre workout energy amplifier, but you can’t. With every ingredient dosage fully exposed its obvious to see that SUPERNOVA™ is a force unlike anything you have ever experienced. This high-tech pre workout ignites your nervous system and overloads your power levels, making you smash every workout and leave the competition light-years behind. Unlike most other pre workouts on the market SUPERNOVA™ has nothing to hide. A fully disclosed formula along with zero proprietary ingredients, artificial colors, aspartame, sugar, gluten or calories the advanced formula of SUPERNOVA™ has been crafted with your fitness goals in mind. SUPERNOVA™ is an industry first, filling your veins with a massive 6000 mg of skin-tearing, performance-enhancing Citrulline Malate! In addition to this and the 4X Energy Core Technology SUPERNOVA™ is packed with Beta Alanine, Betaine, Theanine and Huperzine. The matrix of these ingredients will change your workout forever, providing your muscles with advance nutrient transportation, ignited energy & focus and amplified vasodilation. Fruit Punch Flavour Shown. Nutritional information and ingredients may vary from flavour to flavour. Natural and Artificial Flavours, Citric Acid, Malic Acid, Tartaric Acid, Acesulfame Potassium, Sucralose, Red Beet Powder. 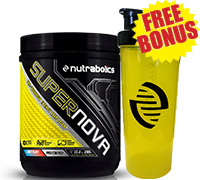 Consume 1 serving of SUPERNOVA™ (14.4 g) to 8 oz – 10 oz / 250 ml – 300 ml of cold water and stir or shake for a few seconds. Consume 15 minutes before exercise. Begin with 1 packet to assess tolerance before considering increasing the dosage. For best results, combine with a diet and exercise program. For adult use only. Keep out of reach of children. Consult your physician before using the product if you have any medical condition. Do not use if you are pregnant or nursing. 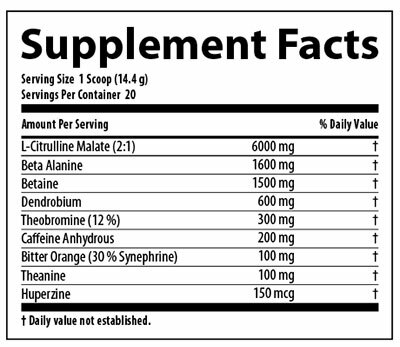 WHAT DEFINES A STRONG PRE-WORKOUT SUPPLEMENT? The requirements for a great pre-workout are simple; strong energy, and huge muscle pumps. A strong pre-workout will generate consistent blood flow with lots of increased muscle cell volume, along with a hard-hitting, non-jittery energy rush. SUPERNOVA™ does both of these these exceptionally well. In addition, SUPERNOVA™ is formulated to take full advantage of your muscles by enhancing nutrient flow efficiency and supporting other anabolic processes. Another factor to consider in a pre-workout is digestibility. Some pre-workout supplements can give you “gut-rot,” or cramping, due largely in part to impure or low-grade ingredients and fillers. Unlike these products, SUPERNOVA™ is pure, so you can bring uninterrupted power and intensity to your training. WHY USE A PRE-WORKOUT SUPPLEMENT? WHAT IS 4X ENERGY CORE TECHNOLOGY? 4X Energy Core Technology is a combination of Dendrobium, Theobromin, Synephrine and Caffeine to target every synapse in your brain to fire in sync to deliver an optimal workout performance. WHEN AND HOW SHOULD I TAKE SUPERNOVA™? For best results, it is recommended that you consume SUPERNOVA™ 15-20 minutes prior to intense exercise. Due to the ultra-concentrated properties of SUPERNOVA™, it is recommended that you begin usage with 1 scoop (6g) to assess your tolerance. After evaluating your tolerance you can increase your dosage to 1.5 or 2 servings. Do not exceed 2 doses in any 24 hour period.